After 20 years on the bench, Spokane County District Court Judge Gregory Tripp is retiring at the end of September; former District Court Judge Randy Brandt, who was rejected by voters three years ago, would like to replace him. Voters narrowly rejected Randy Brandt as a Spokane County District Court judge three years ago. Now, with District Court Judge Gregory Tripp's retirement, Brandt is interested in taking over Tripp's position. Tripp's last day is Sept. 29. Spokane County commissioners will then appoint a replacement, who will serve for the remainder of the term, ending in January 2019. The new appointed judge will have to run for re-election in 2018 to retain the spot on the bench. Brandt, the former judge eyeing Tripp's soon-to-be-empty seat, also applied for an appointment back in 2016 after Judge Sara Derr retired; he was one of five finalists. County commissioners eventually appointed Jeff Smith, a civil attorney, to replace Derr. Critics say that Brandt's appointment would be a finger in the eye of voters, who elected Judge Aimee Maurer over Brandt in 2014. Others, however, don't see a Brandt appointment as a complete circumvention of the democratic process. "Once you're appointed, you have to run at the next election," says Jim Murphy, a retired Spokane judge. "I think the democratic will is certainly well served by that requirement. If the people don't feel that appointment is appropriate, they can vote [them] out." Murphy adds: "You've got to consider the fact that you have a group of county commissioners who are part of one party or the other, and are certain to appoint someone who follows their values. It's a political process. "The bottom line, in my opinion, is the will of the people is still there, and they have a chance to exercise that in a relatively short period of time." Asked why he should receive the appointment this year, Brandt says his narrow defeat (he received 48 percent of the vote in November 2014) was because he was "outcampaigned," not because he was unqualified. "I did not present my position that I was at the time, and continue to be, in support of justice reforms," Brandt says. "But I have spent two years getting ready to be back on the bench." Since 2014, Brandt says, he's rubbed elbows with county commissioners, asking for their vote. "It's what I was born to do," Brandt says. "I love the work. I enjoyed every day I went to the court, and it's my life's calling. No question." Typically, applicants for judicial appointment are interviewed and ranked by the Spokane County Bar Association. That information is sent to county commissioners, who then decide which candidates to interview. Eleven candidates applied for the most recent District Court vacancy in 2016, including Spokane County Public Defender Tom Krzyminski, Airway Heights Municipal Court Judge Jennifer Fassbender, attorney Eric Roth and deputy prosecutor Jim Kaufman, among others. It's unclear whether Spokane County commissioners will ask for more applications, or simply use the pool from 2016. "I'm going to have to speak with Commissioner French and with whoever fills the vacant District 2 seat," Commissioner Josh Kerns says, referring to the empty seat on the board of county commissioners. "I would like to see a situation where if anybody else wants to be on the list, they could apply now." Kerns adds that he would like to interview three or four of the top applicants in an open, public forum. Asked whether Brandt's election loss in 2014 will be a factor in his decision, Kerns says it's not an absolute disqualifier, but it's "definitely something that we have to weigh when we look at qualifications." "I don't want to predetermine who all the applicants are going to be," Commissioner Al French says. "There is a process we go through, and I fully expect that Judge Brandt will be part of that." French expects to fill Tripp's seat by November. District Court judges in Washington state currently make $161,092 annually, which is set by a state commission. Their salaries are scheduled to increase to $164,313 next year. There is some debate across the country about whether judges should be elected in the first place. Critics of judicial elections point to research showing that judges tend to be more punitive closer to an election cycle. A 2010 study of Washington state judges found that sentences were about 10 percent longer near the end of a judge's term than at the beginning. Proponents say that judicial elections can give the public more investment in and respect for the justice system, not to mention more control. Except, of course, when a judge retires before the end of his or her term. Generally, incumbent judges have an advantage in elections, says David Brody, a Washington State University professor who studies judicial elections. "At the municipal and district court levels, they have a name recognition advantage," Brody says. "They generally get more endorsements. It's easy to raise donations for their campaign." Tripp was appointed to the bench in 1997, and first won re-election in 1998. He's held the seat ever since. 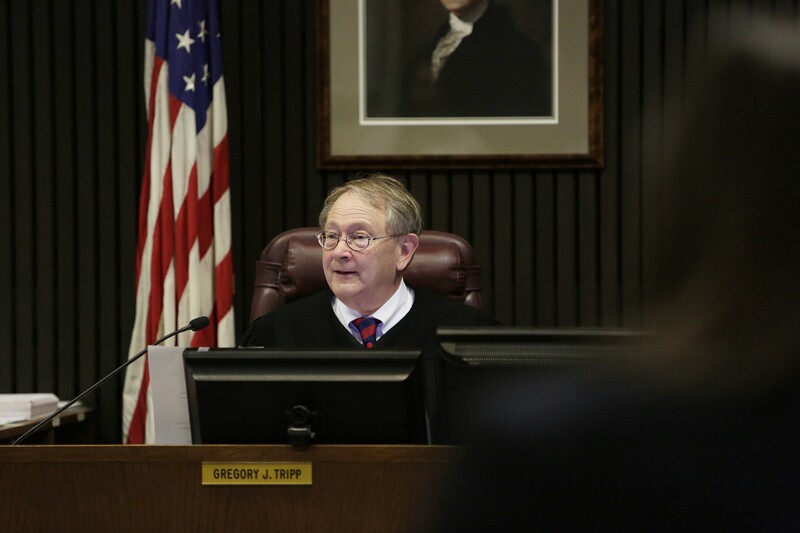 "During the last twenty years, Judge Tripp has been a tremendous positive force for the Spokane County District Court," fellow Spokane County District Court Judge Richard Leland says in a prepared statement. "With his retirement, we are losing a great deal of experience and leadership." Tripp was honored as the Washington State Bar Association's Outstanding Judge in 2007 and judge of the year in 2014 by the Washington State Misdemeanant Corrections Association. He also took some flak in recent years from public defenders, who motioned to remove cases from Tripp's courtroom to another judge more than 200 times between February 2015 and July 2016. Defendants in District Court, facing low-level crimes, are assigned to a judge based on the first letter of their last name. The motions filed by public defenders, known as "affidavits of prejudice," are basically a statement by attorneys that their clients won't get a fair shake. Although the motion is not necessarily unusual in state courts, filing them en masse, as Spokane public defenders have, is atypical. Tripp says his time on the bench has emphasized the need for the public to have greater access to the justice system. Initiatives such as the Northwest Justice Project's CLEAR Hotline and washingtonlawhelp.org, as examples, connect low-income individuals and seniors with legal advice and services; he also cites the Moderate Means Program, which helps people find lawyers who work at a reduced rate. "The courts need to continue to evolve to meet the needs of the community," Tripp says. He points to therapeutic courts such as Spokane's Veterans Enhanced Treatment Court, which diverts veterans charged with minor crimes away from the traditional court system and into treatment.